"I've long respected Martin Cradick's appreciation for Baka Pygmy music. 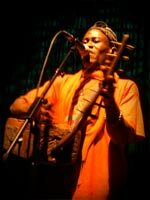 For two decades, he's recorded and reinterpretated this Congolese music with his wife, Su Hart, and a host of traditional musicians from the Cameroonian forest regions. The appreciation never went much past that, however - his production always leaned a little too Afropop-ish for my tastes. Shades of this leaning do appear on this latest collection of 10 songs, though overall it is a much more intimate, less-produced effort than any album he's made. The traditional singing is rich, the guitars are shiny without being tinny, and the percussion and bass undertones are perfectly placed. Instead of sounding like village music going into the studio, it sounds like the studio has entered the village - exactly what you want in a modern ethnomusicological expedition. 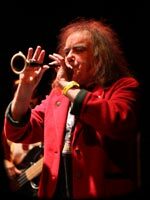 The opening "Marriage of West with East" meshes the local ndong - a single note bamboo flute that the player mixes with his voice - with Cradick's poignant guitar playing, not to mention a well-placed jaw harp. The album's title track employs women villagers' yelli style of unison chanting, while the bass follows a main vocal melody. Cradick can never miss an oportunity at culture mashing, as he does on the beautiful "Illa Dhuinn", adding in the Gaelic influence of uilleann pipes to this local folk song. Cradick has always created songs I've enjoyed; by going beyond the forest, he's made an entire album worth repeating beginning to end."